Goethe University Frankfurt can continue its study of the Nok Culture. The German Research Foundation has recently approved the funding application submitted by Professor Peter Breunig, Professor of African Archaeology, and Professor Katharina Neumann, Professor of African Archaeobotany. This means that an additional € 1.5 million are available to complete the project, which explores the 2,500-year-old West African culture. The long-term project, which is designed to take a total of twelve years, has been examining all the main aspects of the Nigerian Nok Culture since 2009. The researchers from Frankfurt are working on site alongside their Nigerian colleagues and have also employed a large number of local helpers. At times, the project was the largest employer in the area. Surveys, excavations and extensive data analysis are making a significant contribution to deeper knowledge of chronology, settlement, land use and environment, iron metallurgy, material culture and geographical range. Peter Breunig is very pleased about the merry pre-Christmas news that the project will be funded right through to the end: “It really is something very special for an archaeologist when you can conduct such extensive research over many years and with a large team thanks to such broad support.” The Nok project is outstanding in terms of content too: not many projects worldwide are set out to explore an entire archaeological culture. The Nok Culture, which lasted for about 1,500 years and is named after the small village of Nok to the north-east of Abuja, the capital city, emerged around 1500 BC. This is also one of the things that the project has unearthed. At that time, the population lived in simple farming communities and its most important crop was pearl millet. The ornate terracotta figures, for which the Nok Culture is known outside the archaeological world too, emerged 600 years later, i.e. around 900 BC. Looting had already brought many to light before the Frankfurt researchers got to work – the statuettes are coveted objects on the international art market. “The fired clay sculptures represent the oldest and some of the largest examples of figurine art in sub-Saharan Africa,” explains Breunig. What purpose did the terracottas serve, some of which portray people and others animals? What was their original function when they were made about 2,500 years ago? This has been one of the main questions over the last nine years. The researchers presumed that the figures played a role in burial rites. And indeed, at some sites they were able to locate features interpreted as graves near the terracottas, for example in Ifana where they found around 20. “The custom of making a clay effigy of a deceased dignitary and placing it on the grave still exists in West Africa today. When the figures have weathered, they are all buried together at the same spot,” say Professor Breunig. Perhaps it was the same back then. The researchers have gained many other important insights besides that. “We know how the Nok people settled, what their pottery looked like, that it was travelling craftsmen who made the terracottas,” says Breunig. And thanks to close cooperation with archaeobotanist Professor Katharina Neumann, the researchers also know what they ate and how their surrounding landscape changed over the course of time. The decline of the Nok Culture began around 400 BC; terracottas and Nok ceramics finally disappeared at the latest by the birth of Christ. After Breunig and a member of his team were kidnapped in February 2017, the team has returned to Africa only once and did not venture beyond the capital. “But we’ve finished our field research anyway. We’ve got enough to do in the next three years,” explains Breunig. The focus now is on the last remaining studies and publications on settlement, structure and chronology of the sites and the material culture as well as analysis, classification and long-term storage and accessibility of the data. 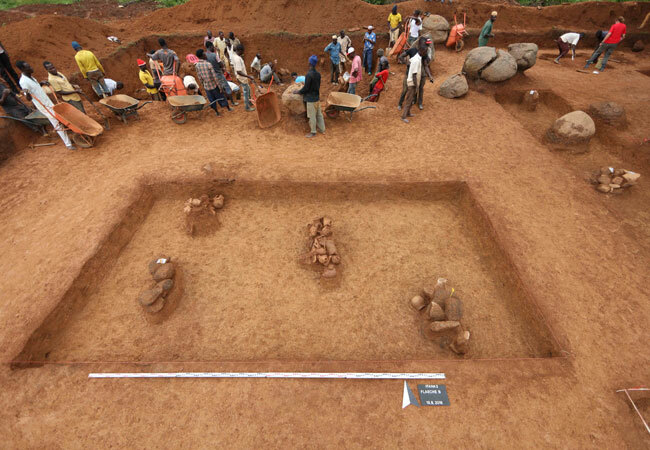 In view of the extensive excavations, volume of data obtained, modern methods applied, countless carbon 14 dating results and the breadth of topics examined, the Nok Culture numbers – thanks to this project – amongst the most thoroughly investigated archaeological complexes in West Africa. The archaeobotanical research work led by Professor Neumann also plays a prominent role in the project. Her objective is to design a model for vegetation development as well as resource and land use in the Nok region from the beginning of the Nok Culture around 1500 BC up until the first centuries AD. With the help of botanical macroremains and analysis of the chemical residues found in ceramics, her team is examining how the early Nok population adapted to a new habitat, how overexploitation in the Middle Nok period (900 to 400 BC) led to soil degradation and what role this might have played in the decline of the Nok Culture after 400 BC. The Research Unit “Ecological and Cultural Change in West and Central Africa” funded by the German Research Foundation had already conducted initial research work related to the project from 2005 onwards. The long-term project then entered its first phase shortly after the global conference on African archaeology at Goethe University Frankfurt in 2008, which was opened by Namadi Sambo, later vice-president of Nigeria. One of the highlights was undoubtedly the much acclaimed exhibition “Nok – African sculpture in archaeological context” in 2013/14 at the Liebieghaus Museum in Frankfurt, which was also financed by the German Research Foundation. Since this year, the exhibits are on display at Kaduna National Museum under the title “NOK Within the Context of Nigerian Art Traditions”. All materials which were brought to Frankfurt for research purposes are also returned to Nigeria. Amongst others, a workshop is planned for the last phase of the project that aims to position Nok ceramics within a broader West African context. By comparing ceramics from other West African regions, the researchers hope to find further answers to the question of where the Nok people came from and how they lived.